As I mentioned before, all of the wonderful holiday gatherings we attend bless us with the opportunity to visit with family and friends, and with an abundance of leftover meats, cheeses and vegetables. 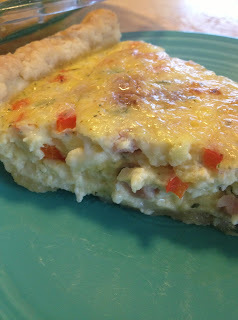 A couple days after Christmas, I woke craving quiche. What a perfect use for the leftovers in my refrigerator! I love to cook, however baking is not really one of my strong skills. Probably because it requires more precise measurements and I rarely measure anything (in fact, I often struggle to figure out the actual measurements for the recipes I post in this blog! ), and because it seems to take a bit more patience. This crust is very simple and forgiving. 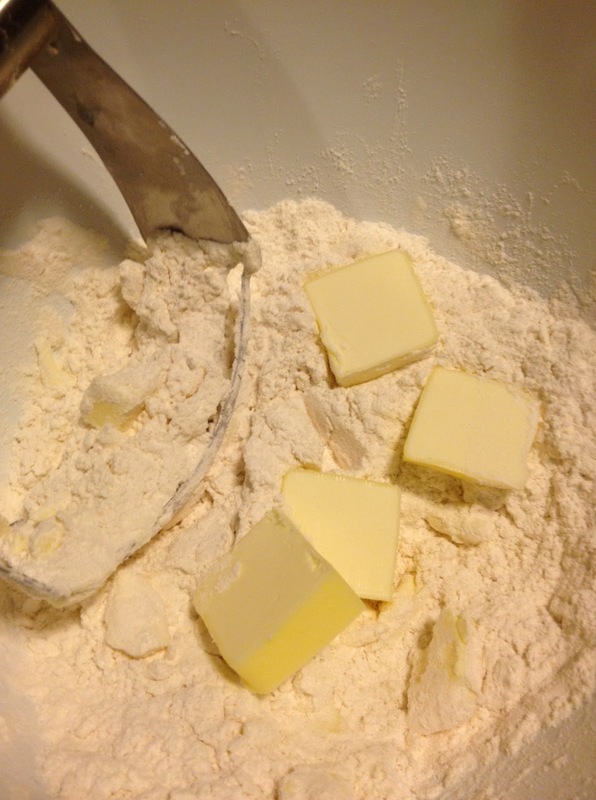 Mix the flour, salt and sugar in a bowl. Add the butter, mix into the flour with a pastry cutter. 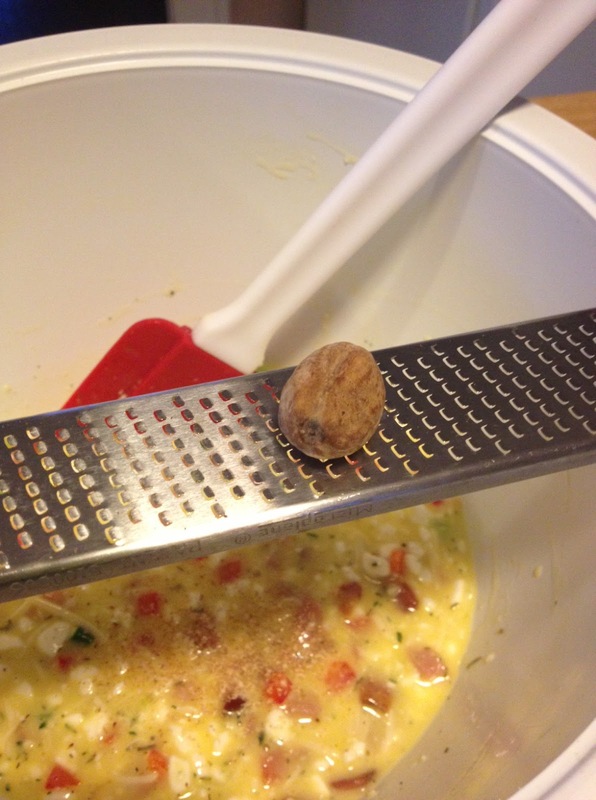 Blend until the mixture is crumbly. 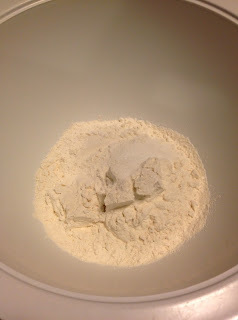 Add the ice water, 1 tablespoon at a time and work into the flour with your hands. Be careful not to over work it. When the dough forms, divide in half and form to balls. Press into disks between plastic wrap and refrigerate for at least an hour. Roll dough onto a flour surface until it’s about 14in round. Roll onto the rolling pin and transfer to pie dish. 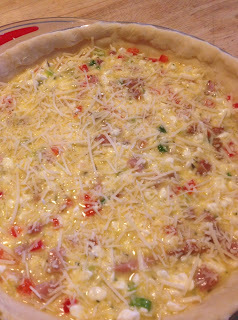 Press into the dish and form the edges of the crust. For those of us who aren’t pastry chefs, the term “rustic” was invented. 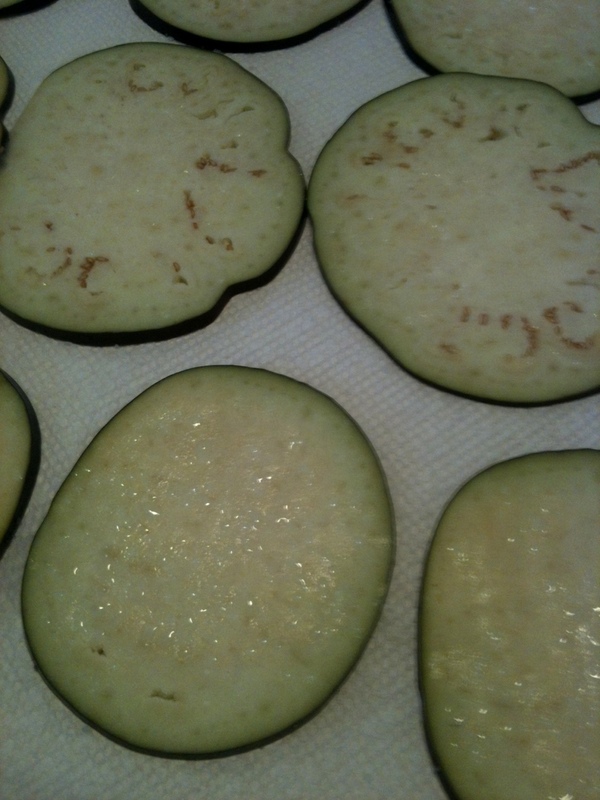 I just smoosh (highly technical cooking term!) the crust so that it’s even around the dish. 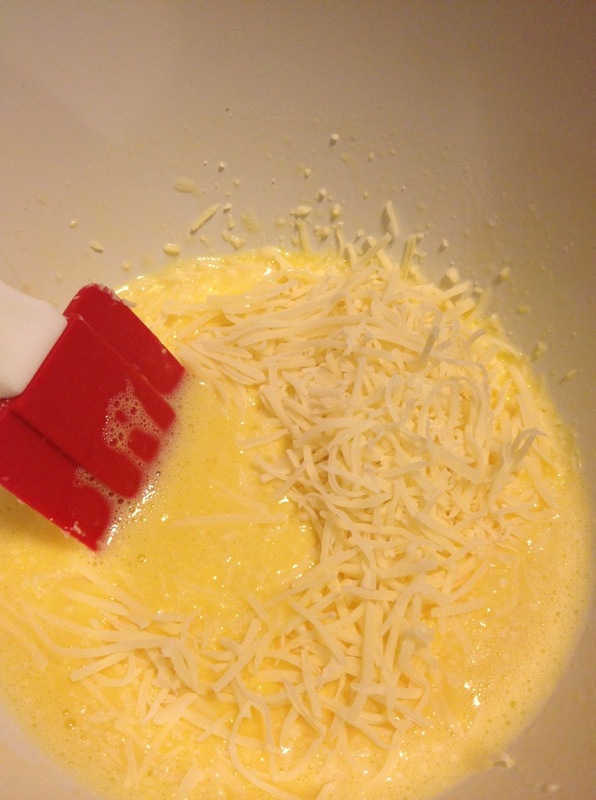 Beat the eggs and stir in the cottage and Swiss cheeses. 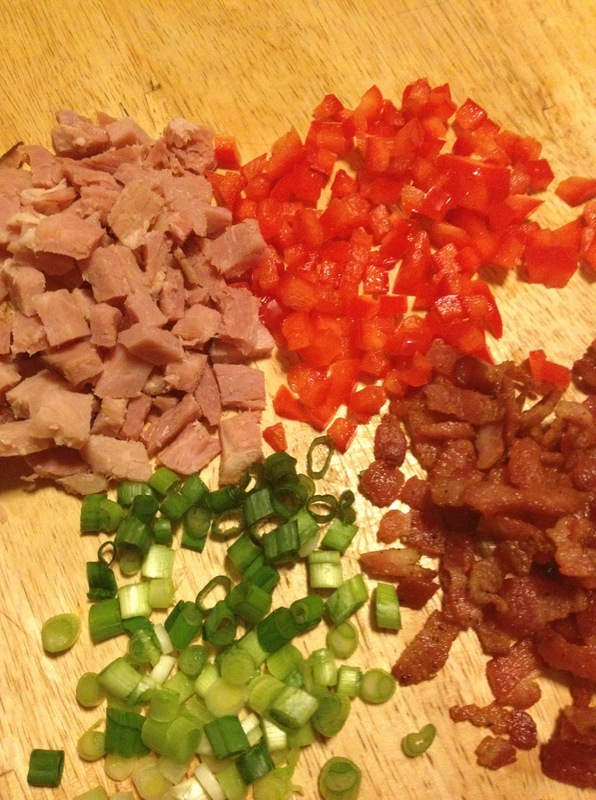 Add the meat and vegetables. 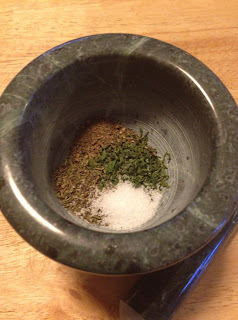 Blend parsley, thyme, salt and pepper. 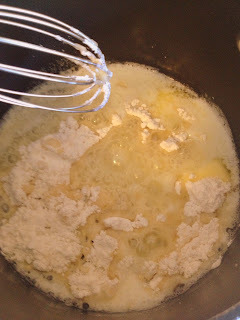 Add to egg mixture. Pour into the pie crust and sprinkle the Parmesan cheese on top. 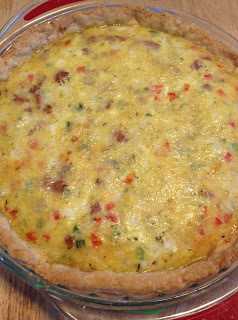 Bake at 375 degrees for about 40 minutes or until the crust is golden brown and the quiche is firm in the middle. I put the broiler on for a couple minutes to brown the cheese on the top. This quiche is light and moist. Serve with fruit for a tasty breakfast, lunch or dinner. It is just as wonderful warmed the next day too!! Ahh the holidays! Food, food and more food! It never fails that more than one typically non-cooking friend or family member brings a cheese tray to the holiday gathering. Now, don’t get me wrong…I adore cheese! However, you will inevitably have cheese left over after your event and there is only so much cheese and crackers any of us can handle. Other than using it for a toasty grilled ham and cheese, there is something very simple you can do with all that cheese. A quick cheese sauce. 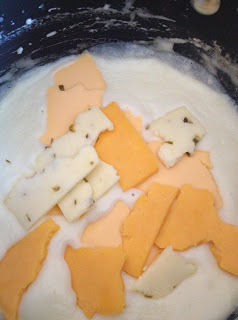 The cheese sauce can become a creamy fondue that can turn that leftover veggie tray into a fun and tasty meal. 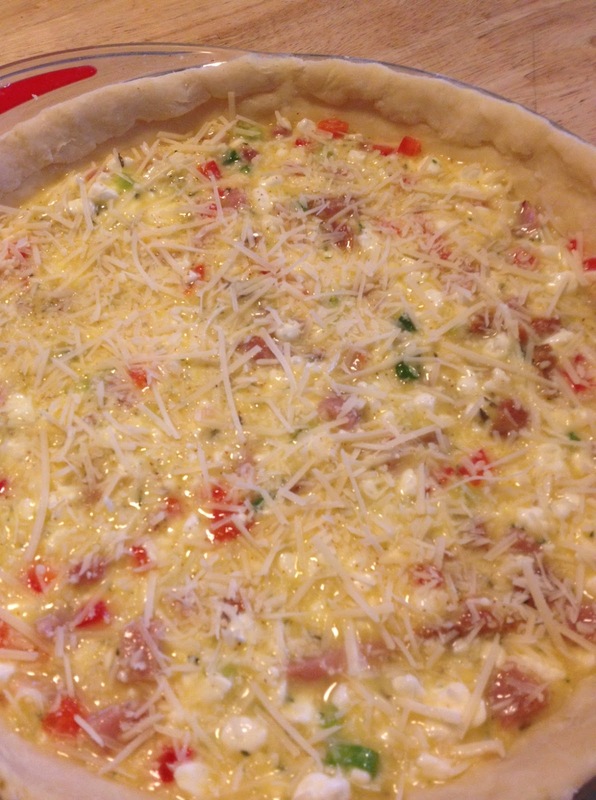 It can also be used as a base for a turkey tetrazzini or homemade macaroni and cheese. 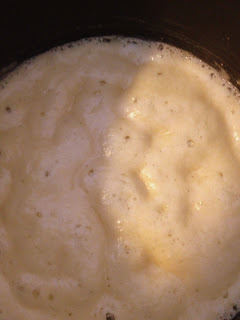 Start by making a roux. The amount will depend on the amount of sauce you want to make. 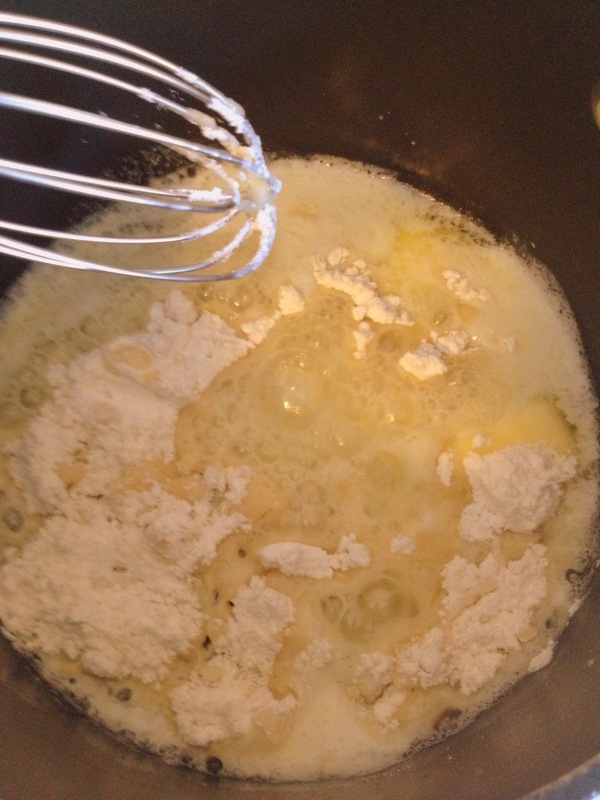 A roux is basically made from equal parts of butter (or some fat) to flour. Melt butter over medium high heat. 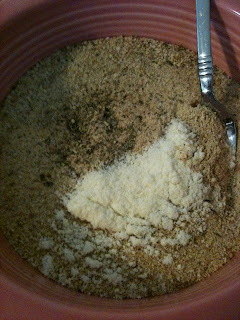 Add flour, whisking for several minutes until the mixture turns a light brown and a nutty scent develops. 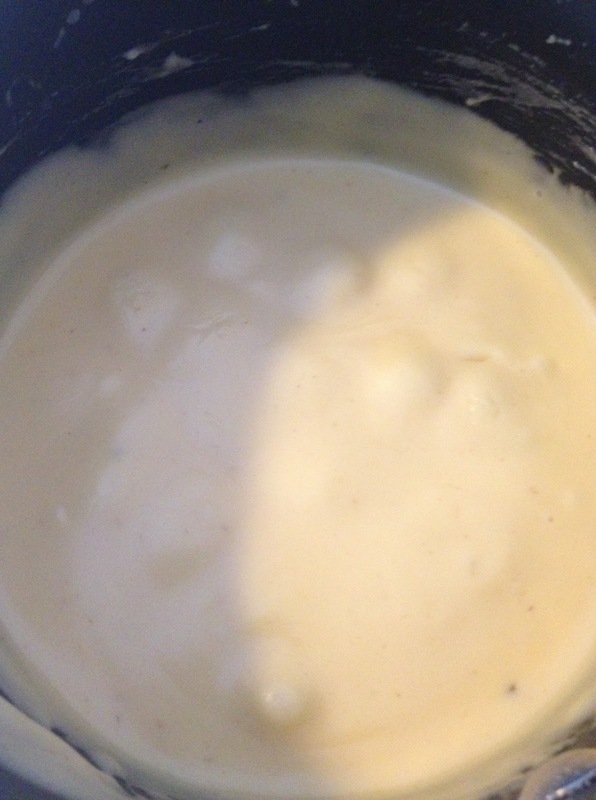 Make a béchamel sauce by pouring in milk slowly, whisking constantly. The mixture will thicken. Continue to add milk to desired consistency. Add the cheese. When I am using leftover cheese tray slices, I just tear them as I put them in the pan. Add several drops of hot sauce and grated nutmeg. You now have a versatile cheese sauce that can be the base for so many recipes. Add cooked pasta for a homemade macaroni and cheese. To utilize other holiday leftovers such as meats or crudités, stir in pasta, leftover turkey, chicken or ham and peas, mushrooms or broccoli and bake for a tetrazzini casserole. Or, put in a fondue pot and serve with fresh vegetables, day old bread chunks, fresh fruits and pretzels. A few years ago I was introduced to beer batter chicken by a friend. 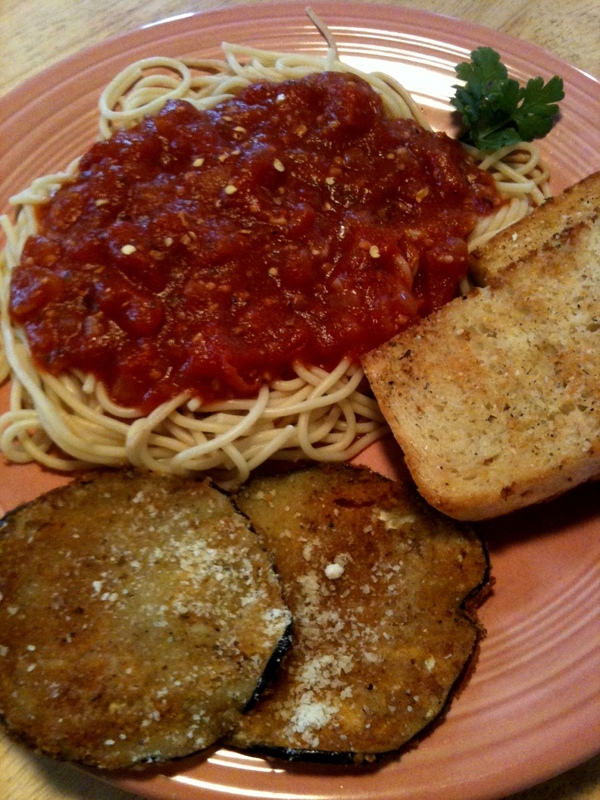 It was a favorite, nearly weekly meal for he and his kids. It quickly became a requested meal by my children as well. 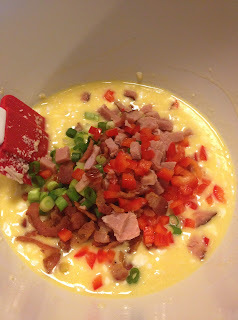 He had used a box mix to make his batter, but I knew I could put together a batter with pantry items that are always on hand and much less expensive. 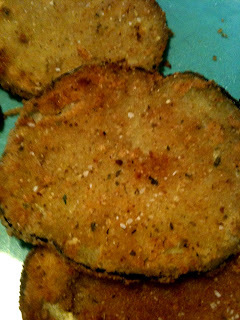 Beer batter chicken night quickly expanded to beer batter chicken and onion rings, then pickles, then green tomatoes, then mushrooms, and then my favorite, garlic cloves. Now we have Beer Batter Everything night!! The one thing I liked about the first beer batter chicken that I had, is it was in two-bite pieces, so I still prepare it like that. What I have found is that this is a perfect “eat around the kitchen island” meal. It never makes it to the table. Fried food is best hot out of the oil, crisp and salty. I put a huge serving plate in the middle of the island with a variety of dipping sauces around it, and everyone just grabs and gabs. The minute the first batch comes out of the oil, the plate is descended upon as if by vultures! I fry in a frying pan, though some prefer to use an electric fryer. I use a standard vegetable oil, but you can use whatever clear, flavorless oil you prefer. Just remember that it must be able to be heated to 365-375 degrees. It takes about 4 cups of oil to fill the pan so that there is about 1 1/2-2 inches of oil in the pan. A fryer will have a temperature setting. For a frying pan, you can use a deep fat frying thermometer. If you don’t have a thermometer, you can test the oil by placing the handle of a wooden spoon in the oil, if the oil bubbles around the handle, it is ready. Some also recommend tossing a small square of bread in the oil and it will brown in about a minute, or tossing in a single kernel of popcorn in and it will pop when the oil is about 360-365 degrees. I use the more discouraged method of dripping a single drop of water into the oil while standing clear of splatter, if it pops, then the oil is ready. Do not use that method unless you are familiar with what happens, to avoid being burned by the popping oil. Whisk all of the ingredients together in a large bowl. Be sure it is well blended. Allow to sit for a few minutes to let the beer bubbles settle. 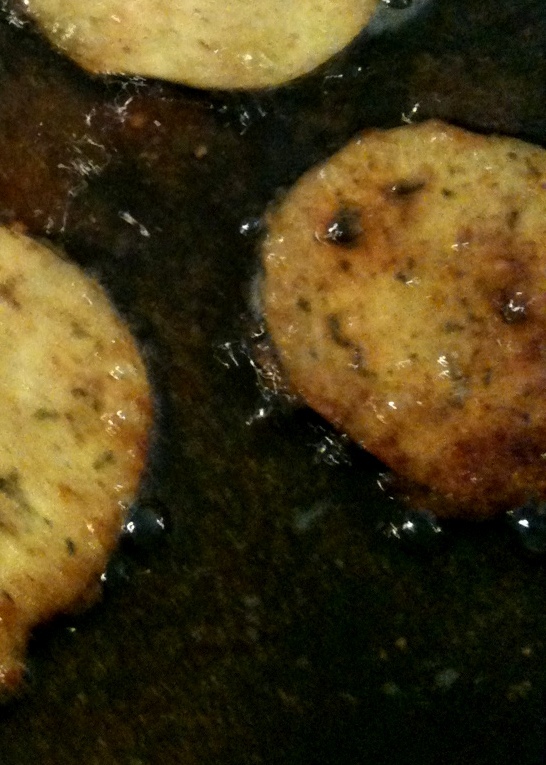 Be sure that the pieces of food that you drop into the oil are consistent in size so they cook evenly. Dip the food into the batter and place gently into the oil. Avoid over-crowding the pan. I put about 8-10 pieces in at a time. Once you have all of the pieces in the oil, use a long handled utensil to be sure they are all separated and not sticking to the bottom of the pan. 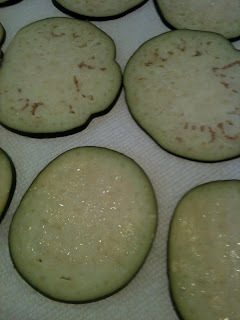 Turn the pieces half-way through when they begin to turn a golden brown. Depending upon the temperature size of the pieces, and what type of food (meat v/s vegetable), it will take about 5-7 minutes for them to cook. 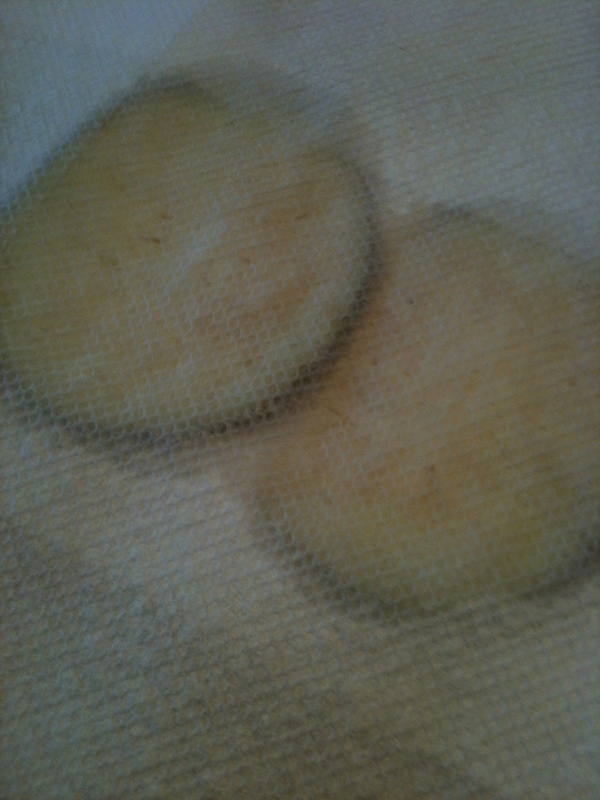 Remove with a slotted spoon and place on clean paper towel. Be sure to change the towel with each batch to keep the food from re-absorbing the oil and becoming greasy and soggy. Salt generously while still hot, then transfer to a fresh paper towel on the serving plate. If you chose to serve the food all together at the table, you can put it on a baking sheet and place in a 300 degree oven to keep it warm and crisp. Serve with a variety of dipping sauces: BBQ, honey mustard, Ranch dressing, Buffalo Sauce, ketchup, Bleu Cheese dressing, etc. Did I mention how much I love fried garlic cloves!?! Be sure to give them a try!! Enjoy!